At Extreme Rules, for the first time ever, there will be a fatal five way extreme rules match to determine the number one contender for Brock Lesnar’s Universal Title. Bray Wyatt heads to the ring. Bray asks for everyone in the arena to stand and rejoice for their one true savior: Bray Wyatt. He talks about “The Beast” and how he will feed on The Beast’s black heart. Out of all of his opponents in the fatal five way, only Wyatt can slay The Beast. He finishes by talking about Roman Reigns, asking what one yard means to a man who owns the world. That’s when Roman Reigns comes out and heads to the ring. In the ring, Reigns tells Wyatt to say whatever he has to say to his face. Wyatt laughs. Reigns isn’t worried about Extreme Rules. His only thought right now is how he’s going to remove Wyatt from his yard. Kurt Angle’s music plays, interrupting the face off in the ring. Angle comes out to the stage and decides to let Reigns and Wyatt settle things in a match. Right now. This wasn’t really much of a match. They fought for a little while, but Samoa Joe didn’t wait too long before coming in and breaking it up. After the match, Samoa Joe continues his attack on Reigns and moves on to attacking Bray Wyatt. Seth Rollins runs to the ring and attacks Joe. 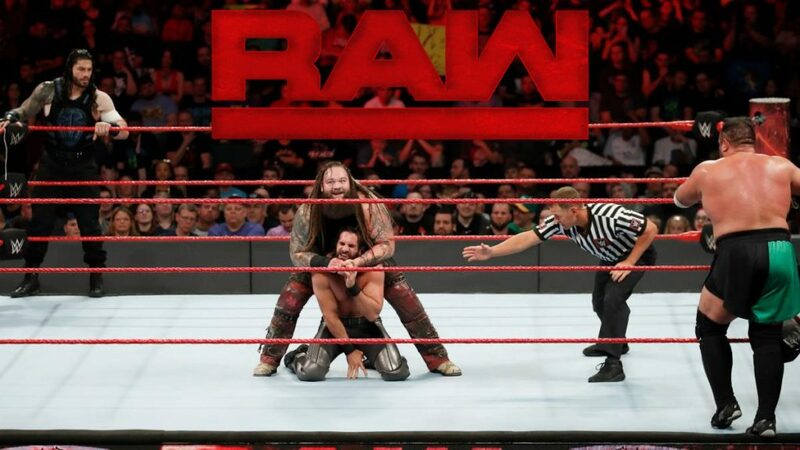 Joe gets out of the ring, and while Bray stands up and gets ready to attack Rollins, Reigns cuts Bray off. The segment ends with Reigns and Rollins standing in the ring together. Reigns tells Rollins he doesn’t need his help. Rollins says he wasn’t out there for Reigns, he was out there to get Joe. Kurt Angle walks up and says that he’s made a tag match for tonight: Rollins and Reigns versus Joe and Wyatt. Elias Samson walks up and Angle decides to put him in a match against Ambrose tonight. Samson says nothing. This was pretty good. Tozawa showed his speed, but the match was only a couple of minutes long so there wasn’t really a lot to it. Charly Caruso asks Sasha Banks about Alicia Fox. Banks just wants to get away from Fox. Fox and Noam Dar walk up and tell her that she’s just jealous of their relationship. Elias Samson is in the ring, sitting on a stool with his guitar. He plays and sings a song about Grand Rapids and Dean Ambrose. Ambrose interrupts the song with his entrance music. This was okay. Samson looked fine in his RAW in-ring debut, but he just felt like a prop in a larger story here (because he was). After the match, Ambrose chases and catches The Miz. Before Ambrose can do anything, Samson hits Ambrose with a swinging neckbreaker. The Miz is proud of himself as he stands on the stage with Maryse. John Cone leads Big Cass to Enzo Amore who is mysteriously unconcious on the floor of the backstage area. After a commercial break, Enzo says he was jumped but doesn’t know who did it. Kurt Angle says he’ll get to the bottom of it. Big Cass is not happy. Finn Balor makes his way to the ring. Balor begins to talk about being focused on Extreme Rules when Paul Heyman interrupts. On his way to the ring, Heyman talks about each of the contenders in the fatal five way and why anyone who wins will be a victim of Brock Lesnar. In the ring, Heyman says Balor is “nobody’s victim.” He says Balor is not an underdog in the fatal five way. Heyman says Balor is the best in-ring competitor in the WWE. Heyman is most interested and intrigued by a matchup between Balor and Lesnar. He wishes Balor luck and shakes his hand. Balor has a simple message for Lesnar: he’s going to beat Lesnar. Good match. Fairly straightforward with a little bit of interference from Gallows. A solid match that was really just meant to give Balor some hype going into Extreme Rules. This was practically a squash match. I thought they might be going somewhere with Alicia, and they still might, but Sasha didn’t seem to have any trouble at all in this match. After the match, Noam Dar has some words for Sasha Banks. Sasha slaps him, then Alicia Fox retaliates by hitting Banks with a scissor kick. Kalisto asks Apollo Crews what’s wrong with him. Why is he fighting Titus O’Neil’s battles? Kalisto wonders if Crews attacked Enzo earlier tonight. Crews says he didn’t attack Enzo. He’s just keeping his options open with Titus. Titus O’Neil walks up and offers Kalisto a chance to be part of the Titus Brand. Kalisto wants nothing to do with Titus. Titus thinks that’s a big mistake. Goldust says gold never withers or rusts, but R-Truth’s light is flickering. Goldust is back in the director’s chair and he will decide how his movie ends. The Golden Age is back. Charly Caruso welcomes Alexa Bliss. Bliss does not feel bad for attacking Bayley with a kendo stick last week. She’s not worried about Bayley at Extreme Rules because she doesn’t think Bayley can get extreme. Two weeks ago, Reigns attacked Braun Strowman and injured his elbow. I liked this match. The action was pretty good, but the point was really to show how Crews’ alignment with Titus isn’t working well. Titus was screaming at ringside which repeatedly distracted Crews. I like where the story is going. Good match. This was a hard-fought match from both guys. It went back and forth a little, and the finish was simple, but it worked. After the match, Charly Caruso asks Matt Hardy what stipulation he wants for the title match. Matt picks a steel cage match. Sheamus and Cesaro don’t seem happy. A pretty good match, even though it was pretty short. The winner was never really in question. After the match, Neville attacks Nese and puts him in the Rings of Saturn. Aries doesn’t really seem to care. This was pretty good. Mickie dominated much of the match, but that helped show Alexa’s resiliency. After the match, Bliss grabs a kendo stick and hits Mickie with it. Bayley runs to the ring and manages to take the kendo stick away. Alexa gets out of the ring and backs away before Bayley can use the kendo stick. This was good. At one point Reigns ran into Rollins which you could see coming from a mile away, but other than that, this was a solid tag match for building up Extreme Rules. Finn Balor approaches Kurt Angle and tells him he doesn’t want to be left out of the matches with his opponents at Extreme Rules. Angle agrees, telling Balor that he’ll be in a triple threat match next week against Samoa Joe and Bray Wyatt. Angle goes on to say that Reigns and Rollins will face each other one on one next week as well. There were a bunch of matches on this show. Some of them felt important, but with so many matches most of them weren’t given a lot of time. I suppose it’s a trade off, but I’d rather have fewer matches if it means they’ll be better. As far as the stories on this show, I think they have some interesting things going on. I like smaller stuff with Crews, Fox, and Goldust. Now that Wrestlemania season is well behind us they can focus on some of these smaller stories which I appreciate. The main stories feel like they’re in a bit of a holding pattern, but I like the matches they’re producing so far. I did think it was interesting how Heyman came out and had nothing but nice things to say about Balor. Is that a hint that something is going to happen? Is Heyman pulling for Balor because he thinks Lesnar will have the easiest time with him? Those are some of the questions going through my head, but they’re questions the commentators never brought up. They didn’t really say much of anything about it despite it being a fairly interesting development. The main event was good too, but I think this match felt a little more important.